A 23-year-old woman presented to the emergency department with abdominal pain and a palpable pelvic mass. Her surgical history was pertinent for remote perforated appendicitis that initially required percutaneous drain placement and subsequent appendectomy. Her family history revealed an aunt with uterine cancer. Physical examination showed normal vital signs and tenderness to palpation in the left lower quadrant with associated suprapubic fullness. Initial laboratory results were unremarkable. 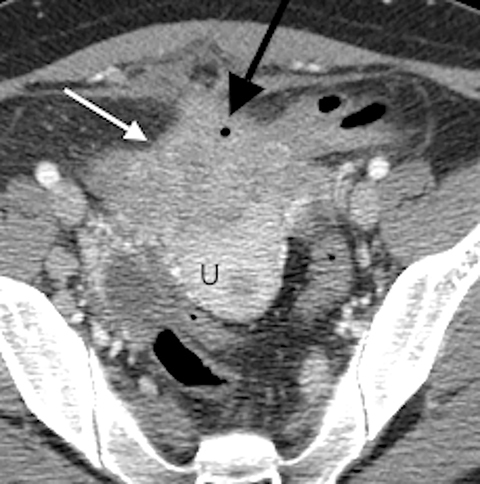 A contrast-enhanced computed tomography (CT) scan of the abdomen and pelvis revealed an ill-defined, partially calcified, enhancing soft-tissue mass containing a few foci of air (Figure 1). The mass was located in the anterior pelvis, abutting the uterine fundus and bladder dome with adherence to nearby small bowel. The presence of air within the mass and its close proximity to bowel raised the suspicion for a fistulous tract formation. There was associated retroperitoneal lymphadenopathy. 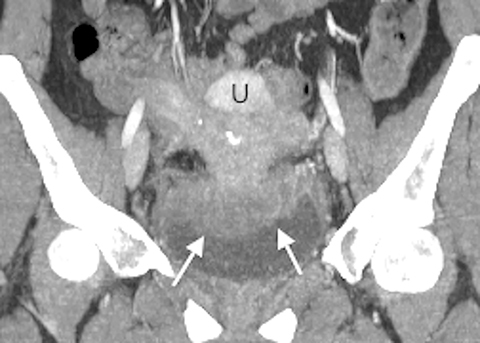 Based on the clinical presentation and imaging findings, the initial differential diagnosis included a urachal adenocarcinoma, inflammatory bowel disease such as Crohn’s disease and deep pelvic endometriosis. An ultrasound (US)-guided percutaneous biopsy of the mass revealed a chronic organizing abscess with filamentous bacteria on GMS stain consistent with an actinomycosis abscess. The patient improved clinically after high dose penicillin treatment. The appendix is the most common area of the gastrointestinal (GI) tract to be populated with actinomycoses. Perforation of an inflamed appendix, or spillage of bowel contents during appendectomy, are proposed mechanisms by which actinomycosis disseminates into the abdomen and pelvis.2 In fact, 65% of abdominopelvic actinomycosis is caused by perforated appendicitis.8 This is the most likely mechanism by which our patient acquired a pelvic infection. Histologically, isolation of sulfur granules from tissue specimens is pathognomonic for the diagnosis of an actinomycosis. Sulfur granules are composed of yellowish purulent material that is composed of filamentous particles of bacteria in association with neutrophils and a granulomatous reaction.3 Culture is also diagnostic, although less than 50% of cultures recover the organism.5 Unfortunately, most actinomycosis infections are diagnosed postoperatively on specimen histology. It is rare that a prospectively identified case of actinomycosis requires surgical intervention. Most patients can successfully be treated medically with high-dose intravenous and oral antibiotics, but they may require treatment for up to 18 months. The aforementioned case demonstrates the tendency for abdomenopelvic actinomycosis to mimic malignancy both in clinical symptomatology and imaging findings.9 CT is the most useful imaging modality for diagnosing actinomycosis, as it reveals the extent of inflammation and invasion of adjacent and distant organs.2,5 Although several cases of abdominal and pelvic actinomycosis have been reported, only a few small cases series describe the specific radiographic features.5,10 In a retrospective investigation of 10 confirmed cases, Ha et al looked at CT features of abdominal actinomycosis in 10 patients. All patients had at least one mass, 8 of which demonstrated dense enhancement following contrast administration. This enhancement is secondary to diffuse granulation tissue and fibrosis precipitated by the infection. A minority of the lesions (3/10) were cystic suggesting that the infection may have been more acute than the more solid lesions. In a more recent study, Lee et al analyzed abdominal actinomycosis of the GI tract in 18 patients, 14 of whom were diagnosed postoperatively and 4 percutaneously sampled.10 One of the more common CT features was concentric bowel-wall thickening (15/18). Inflammatory changes bordering the involved bowel wall were seen in 17 cases. A large mass adjacent to the involved bowel wall was identified in 17 of the 18 cases. The masses were predominantly cystic in those with rectosigmoid involvement, and predominantly solid in those with transverse colon or appendiceal involvement. In 50% of patients, the mass extended or infiltrated into an adjacent ureter resulting in hydronephrosis and/or hydrourete.10 Scattered lymph node enlargement was identified in only 5 patients. 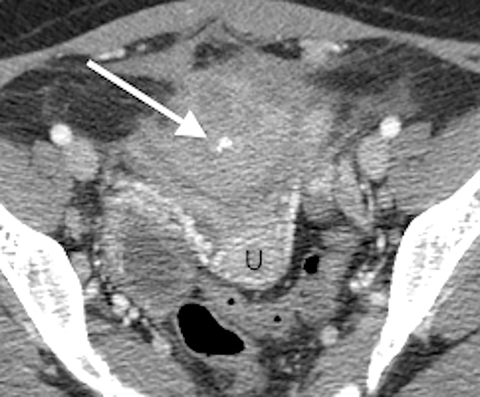 While nonspecific, the imaging features seen in this case highlight the common CT findings in abdominopelvic actinomycosis. The imaging findings are often confusing and misleading, usually delaying the diagnosis. CT is the most useful modality to evaluate the extent of the disease process; however, the imaging findings are generally non-specific. Most commonly, an ill-defined, infiltrating enhancing mass (pseudotumor) is identified, crossing tissue planes and invading adjacent structures, thus mimicking a neoplastic process. Despite a suspicion of malignancy, our case was discovered prior to surgical intervention and the patient clinically improved with medical treatment alone. Abdominopelvic actinomycosis should be considered in the differential diagnosis of patients who present with abdominal/pelvic masses who have risk factors for the infection. Acquiring a definitive diagnosis via percutaneous biopsy can prevent patients from undergoing unnecessary surgical intervention. Acevedo F, Baudrand R, Letelier LM et al. Actinomycosis: A great pretender. Case reports of unusual presentations and a review of the literature. Int J Infect Dis. 2008 Jul;12(4):358-362. Garner JP,Macdonald M,Kumar PK. Abdominalactinomycosis. Int J Surg. 2007; 5(6):441-448. Feingold, A., Meislich, D. (2012) Anaerobic Gram-Positive, Nonsporulating Bacilli (including Actinomycosis). In Long (ed) Principles and Practice of Pediatric Infectious Diseases, 4th ed. Saunders. P990-992. Postal A, Detry O, Louis E et al. Ileo-caecal actinomycosis: Report of a case simulating complicated inflammatory bowel disease. Acta Gastroenterol Belg. 2001;64(4):318-320. Ha HK,Lee HJ,Kim H et al. Abdominal actinomycosis: CT findings in 10 patients. AJR Am J Roentgenol. 1993 Oct;161(4):791-794. Kocabay G, Cagatay A, Eraksoy H et al. A case of isolated hepatic actinomycosis causing right pulmonary empyema. Chin Med J (Engl). 2006;119(13):1133–1135. Lall T, Shehab TM, Valenstein P. Isolated hepatic actinomycosis: A case report. J Med Case Rep. 2010;4:45. doi: 10.1186/1752-1947-4-45. Wong VK,Turmezei TD,Weston VC. Actinomycosis. Brit Med J. 2011; Oct 11; 343: d6099. Pusiol T, Morichetti D, Pedrazzani C et al. Abdominal-pelvic actinomycosis mimicking malignant neoplasm. Infect Dis Obstet Gynecol. 2011;2011:747059. Prepared by Ms. Mohajeri, Dr. Taffel and Dr. Khati while at the Department of Radiology, George Washington University School of Medicine and Health Sciences, Washington, DC.